Sleep apnea is largely a symptom of weight gain and obesity. Therefore, as our population gains weight, we are seeing more and more obstructive sleep apnea. The body mass index (BMI) is a common medical term that gives a numerical value to an to a persons weight. This number is calculated based on overall weight and height of a specific patient. If a person has a BMI great than 25, they are considered to be overweight and greater than 30 is obese. As BMI value exceed 30, the likelihood of obstructive sleep apnea increases. The area graph below provides a general schematic of the relationship between height and weight. 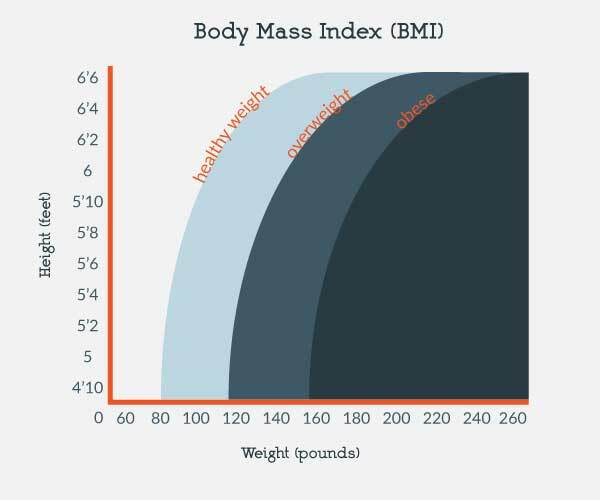 To learn more about body mass index and how it may effect your ability to sleep or your risk in developing sleep apnea contact Arizona Center for Chest Diseases today. We would love to hear from you and would be happy to answer any of your questions. As leading Arizona pulmonary doctors, the physicians at Arizona Center for Chest Diseases are one of the valley experts in sleep apnea. Waking up in the morning and feeling unrested or excessively tired despite a full night sleep may be an indication of a sleep related breathing disorder known as sleep apnea. People who suffer from sleep apnea are unaware that their sleep is disrupted or fragmented by excessive snoring that causes an obstruction in breathing. Symptoms include excessive daytime sleepiness, frequent naps, night time awakenings, morning headaches, and snoring. Sleep apnea is a common condition closely related to obesity or snoring and has significant impact on quality of life. If you find yourself consistently waking up tired or groggy, you may benefit from a formal sleep evaluation at Arizona Center for Chest Diseases. 1. How do you know if you have sleep apnea? People with sleep apnea commonly complain of excessive sleepiness or difficulty maintaining alertness despite at least 7 hours of sleep per night. They typically wake up feeling unrefreshed. Many people with sleep apnea experience morning headaches and dry mouth. Usually their bed partner reports snoring and may describe “hold their breath”. As our population becomes more overweight, sleep apnea becomes more prevalent. Sleep apnea is a symptom of increased weight gain. The degree of daytime sleepiness is assessed with an Epworth Sleepiness Score. The diagnosis is established by a polysomnogram, a formal sleep study. Contact Arizona Center for Chest Diseases to schedule a sleep evaluation. Sleep apnea disrupts more than just a good night’s sleep. In the short term, untreated sleep apnea adversely effects daytime concentration, job performance, and increases risk of motor vehicle accidents. Over a period of time, moderate to severe sleep apnea becomes a risk factor for cardiovascular death, stroke, diabetes, metabolic syndrome, and increases risk of complication when recovering from surgery. If you have symptoms — or a spouse or partner notices irregular breathing at night — ask your Arizona lung doctor about scheduling an overnight sleep study. Overnight sleep studies are the only way to diagnose sleep apnea. 4. Do something about it today! The impact of sleep apnea on the quality of life and overall health can be greatly effected by changes in life style, diet, weight loss, and medical management of sleep apnea through oral devices, application of CPAP, and consideration of surgical options in unique circumstances. Arizona Center for Chest Diseases would like be the one to help with your sleep apnea.